Nancy is back! Though she may not have a horror resume as prolific as some of her contemporaries, Heather Langenkamp is one of the greatest scream queens of all time, playing Nancy Thompson in Wes Craven's original 1984 slasher classic A Nightmare on Elm Street. It was the actress' breakout role, one that pitted her against the greatest screen boogeyman of all time in Freddy Krueger. Langenkamp only returned once to play Nancy a second time in the franchise sequel A Nightmare on Elm Street 3: Dream Warriors. Now, the actress returns to play Nancy yet again in an amazing new fan film called Don't Fall Asleep, where we get to find out exactly what happened to Nancy over the years.
" 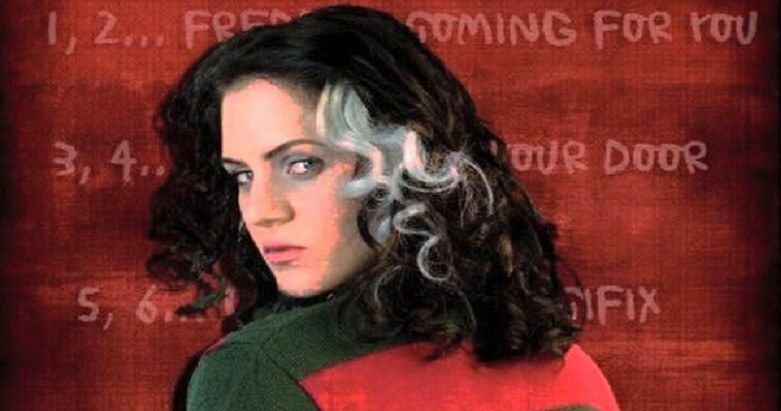 target="_blank">ihorror.com, we have a look at this 45 minute delve into Nancy Thompson's backstory. This is the untold tale of the heroine, who was one of the few people able to take Freddy on one-on-one on his own dream turf. In a surprising move that has always bewildered fans, 1985's A Nightmare on Elm Street 2: Freddy's Revenge didn't pick back up with Nancy to continue her story, instead offering a new set of troubled teen victims for Freddy to prey on. Instead, Nancy wouldn't return until the 3rd installment Dream Warriors. Now, thanks to this new fan film, we have an idea what happened to Nancy between the first and third movies. Nancy's expertise in how to deal with Freddy Krueger sure would have come in handy in Nightmare 2, sadly she was quite preoccupied, if we're to believe the events in this thrilling new expose. Nancy's mother and best friends are all dead when we pick back up with her here. And her relationship with her father has slowly but surely slipped away. Nancy is a woman adrift on her own in the world. A world in which Freddy Krueger still exists. Nancy is struggling to regain faith in herself. It is here that she must rise to become the hero those other new kids on Elm Street need. She must learn to become the true Dream Warrior. In this unique short film, the on-screen role of Nancy Thompson is now played by actress Diandra Lazor. What makes this short so special is that Heather Langenkamp returns some thirty years later to reprise Nancy in the role of narrator. Though she doesn't appear on screen, this is technically the first time she's played the character since 1987. And that's reason enough to make this something quite special. Heather Langenkamp did return to the Nightmare on Elm Street franchise in 1994 alongside director Wes Craven for New Nightmare, which found the actress playing herself. Though she once again had to confront Freddy Krueger, she did not play Nancy in the movie. The actress did appear on a 2014 episode of American Horror Story, and she will return to the horror genre in the sequel/reboot Hellraiser:Judgment next year. While we have a feeling a trailer for that movie is right around the corner, you can check out Don't Fall Asleep in its entirety here.